It’s a windy, clear-eyed Saturday in Aledo. The town exudes peace and quiet, but the scene changes as you pass a flurry of youthful industry at Aledo Middle School. 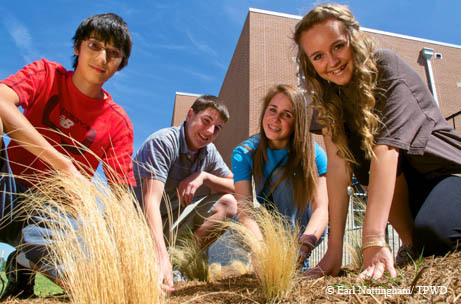 Several eighth-grade students are hoisting shovels with passion, while others tenderly sculpt small piles of mulch around stalks of native prairie grass. Boys and girls cheerfully slog around in mudboots, toting giant, sloshing buckets between the water faucets and their prairie grass demonstration, pouring the water in careful circles around each waving cluster. They barely notice me as they weave past, calling out directions to their classmates. These are the Prairie Protectors, and they exhibit the confidence of construction managers on their small piece of landscape — after all, these teens are the ones who have made it happen. In a landscape previously dominated by Bermuda grass, dandelions and clover, Terry Snow’s eighth-grade science class has built a blackland prairie refuge in this town west of Fort Worth. 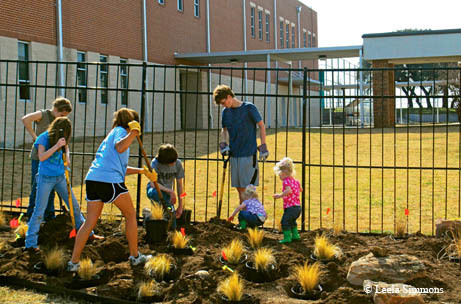 Teacher and students replaced these modern-day squatters with native plants such as big muhly, pink muhly, bluestem and Indian feathergrass to replicate the prairie’s native diversity. This demonstration is part of their ambitious goal to educate themselves and their community about the blackland prairie, one of the most diverse — and most depleted — ecoregions in Texas. For the past two years, Snow and her science students have restored native prairie and developed a trail at a nearby ranch to teach elementary students about native wildlife. Now, they are spending the weekend creating a 1,200-square-foot representation of their trail at their school to strengthen community involvement. Best of all, it’s the kids, not the teacher, who have designed, built and organized each step in the process. “It’s gone from them learning what makes a healthy ecosystem to total ownership of this huge project,” says Snow. The project was made possible by the Healthy Habitat grants, a partnership between the Texas Parks and Wildlife Department, the Texas Parks and Wildlife Foundation, Service Learning Texas and the natural gas company Encana to combine service learning with environmental policy. To Nancy Herron, director of education and outreach for TPWD, it was a natural fit. The program is in its second year, and this year 18 Texas schools and nonprofit youth organizations received more than $170,000 in grants. Each school can receive as much as $10,000 to take on a local environmental problem. When Flour Bluff Intermediate School received a grant to tackle invasive species in Corpus Christi wetlands, students joined forces with local botanical groups to restore native plants, helping migrating birds in the process. In The Woodlands, the Extraordinary Education Family Learning Center attracts butterflies and home school students with its natural habitat refuge for native plants and wildlife. Healthy Habitat grants work toward two main goals. First, the grants endeavor to get the students, and the community, to become aware of their habitat and its issues. Then, as students work with members of their community to actively address these issues, they learn that they can make a difference. Students may also consider possible careers in natural resources. These goals line up with service learning, where curriculum and service are integrated. Students reach out to community partners and identify a need in a community, and teachers skillfully include lessons related to the project in the curriculum. But this real-life learning goes far beyond the classroom. It’s education in action, bringing school curriculum and learning objectives to civic engagement and responsibility. The idea is to allow students to lead the process, with teachers and professionals providing support. “It gives kids room to ask, to probe, to experiment. They learn why things will or won’t work,” says Herron. Studies show that good service learning leads to a rise in career exploration, problem-solving skills, complex reasoning, ethical reasoning, self-confidence, test scores, graduation rates and social involvement. Through their heightened knowledge and involvement, they become empowered in their role in the world and can better translate school curriculum to their life. “Seventy-seven percent of students in service learning programs say service learning had a big effect on motivating them to work hard,” says one recent report. If that motivation doesn’t explain the success of the Prairie Protectors program at Aledo Middle School, nothing will. These eighth-grade students have won awards for their labors, receiving recognition from the Texas Land Conservancy, and have spoken at conferences throughout Texas — teaching teachers. Aledo’s partners include Texas A&M University’s AgriLife Extension Service and the Tarrant Regional Water District. Each of the 80 students helping that day is focused and involved — no cellphones can be seen or heard. When I ask about their work, they reply with the newfound authority of budding TPWD biologists. Valentino utilizes his love of math for this project by collecting water quality and average rainfall data. Alex confidently explains how the grasses in a tallgrass prairie save water in local watersheds. The Aledo project started when pipeline was laid at Bear Creek Ranch, a cattle and educational ranch teeming with native wildlife. The Natural Resources Conservation Service uses the ranch for demonstration for landowners and range management specialists. “Students can get a glimpse of what the area looked like when it was being settled by Europeans and how grazing animals maintained the prairie,” says Robert Potts, president of the Dixon Water Foundation, which supports sustainable watershed management. For the Aledo Healthy Habitat grant, 1,200 elementary and middle school students reseeded 25 acres of the ranch and learned about tributaries and the filtering effects of native prairie grasses. Some students even mimicked bison to try to plant seeds in a natural way, as if the seeds were clinging to the bison hide, then dropping off to reseed. To further spread their knowledge and engage the community, Aledo students then turned an old cattle trail in a riparian zone into a trail of learning stations at Bear Creek Ranch. Eighth-graders use it to teach fifth-grade students about their roles in local ecosystems in a hands-on, holistic way. They even assembled a teepee (made by the same company that worked on the Dances With Wolves sets), incorporating history in their web of hands-on education. For Snow, it was a great way to show students how to apply the classroom concepts of their science lessons. Test scores and student attitudes testify to the success of the program. “I’m going to remember this more than anything we’d be doing just sitting in class,” one student remarks. “In the first year, this site takes 6,300 gallons of water. After that, nothing.” The Bermuda grass uses 12,000 gallons every year. 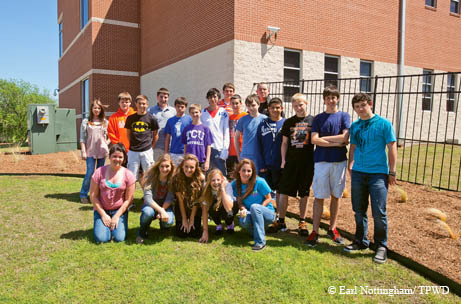 Students planned their project with the help of landscapers and the Tarrant Regional Water District to ensure success. They dug up invasive species, tested soil for sediment filters and researched native grasses — all correlated with Snow’s weekly lesson plan. For many, the reach extends beyond the project. Students’ individual skills combine to shape projects. Many students believe they better understand classroom lessons, while others enjoy working with classmates without cliques. Abby loves the unorthodox assignments Snow usually prepares, but this project is special. Protector chants for the fifth-graders experiencing their trail. Many teachers have not been taught how to incorporate community partners and could be intimidated by the scale of Healthy Habitat projects, Snow says. But help is now available to overcome that obstacle. Grants are available every year, with some former winners competing with newcomers. Snow’s class was able to build a learning trail one year and the prairie grass refuge the next. It’s easy to see the benefits for students, schools and communities from the Healthy Habitat grants. Students discover a real, tangible connection to the world around them — a deeper understanding that comes with the territory of engagement. “We’re digging in the dirt,” laughs Snow. “They get to be a part of something, so they’re giving up their Saturday. Once they realize no one’s going to tell them no, it’s theirs. Service Learning Texas provides Healthy Habitat grant applications on its website, www.servicelearningtexas.org; applications are due by June 20, and pre-proposals are due May 31. Open to fifth- through 12th-grade students, grants are available for state and nonprofit organizations, as well as public, nonprofit private or open charter schools. In the application, applicants must explain a local issue as outlined by the Texas Conservation Action Plan, their plan of action and their engagement with community and TPWD partners.